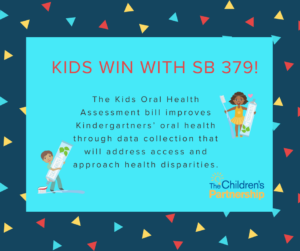 Los Angeles, CA – Children’s oral health advocates, The Children’s Partnership, Children Now and California Dental Association applauded Governor Jerry Brown for signing Senate bill 379 by State Senator Toni Atkins (D-San Diego). 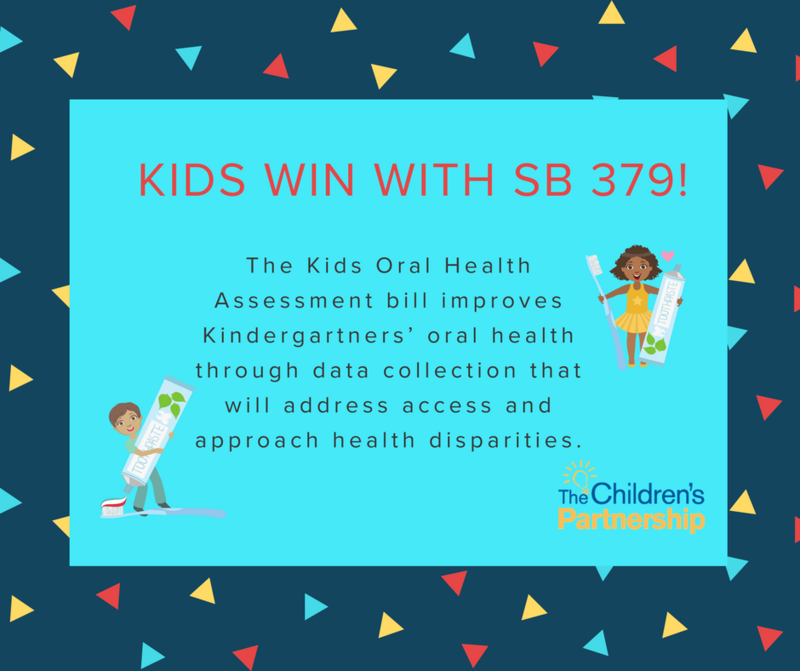 By making the statutory updates reflected in SB 379 to the existing assessment, it will facilitate the efficient collection and reporting of data needed for the State Oral Health Plan and ultimately to address disparities in access to oral health services across the state. Tooth decay is the number one chronic disease among children. It accounts for persistent pain, trouble eating, and sleeping, missed school days, and expensive emergency room visits for mostly preventable dental problems. Children, low-income families, and other underserved populations experience disproportionate levels of oral disease in large part due to difficulties accessing early preventive and routine oral health care. By reporting the data, we look to set goals and an agenda that diminishes such negative experiences for children and further strengthens prevention efforts and long-term health and well-being benefits for children. “We are pleased by the Governor’s signature of SB 379 (Atkins) which enhances the early intervention and prevention goals set forth by the Kids Oral Health Assessment. By having a clearer understanding of the needs of our children, we can collaborate with the Dental Director to address the oral health disparities of the most vulnerable children in our state,” said President of The Children’s Partnership, Mayra E. Alvarez. “SB 379 is a good step towards building a statewide oral health surveillance system, which California has sorely lacked, undermining our ability to truly understand the pervasiveness of childhood caries. We look forward to continuing our work with local stakeholders to ensure that the Kindergarten Oral Health Assessment data is collected and reported so resources can be targeted to those with the highest need,” said Senior Managing Director, Media & Health Policy of Children Now, Eileen Espejo.